5.5" x 7.5" original watercolor on Yupo paper, matted to 8" x 10"
They may be at your house soon. One has just been spotted in North Carolina. See their 2013 migration map here! I love the vibrancy of this! The colors hum just like the bird would! Well done! I also love the purple flowers below and their sweet nostalgic feel. Yes, this little guy is energized. I see a whole garden behind this hummer too, Katherine. All the stuff that "painted itself", looks so purposely put and like foliage to me. (I see roses too - giving it that nostalgic feel.) This was drawn on the yupo paper with ink and then "filled in" with watercolor in less than 20 minutes. I can't always do that, unless I just 'nudge or suggest' and allow the piece to kinda paint itself. It's a rush! Glad you are all ready for your hummingbirds and thanks for the shout, Kathryn! 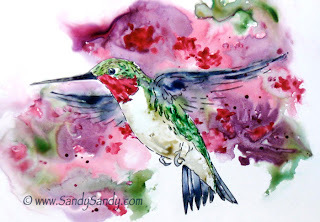 This painting is full of joy and vibrancy...even with the muted background it makes the hummingbird really pop out, as if I am seeing it through a camera lense with the background a bit fuzzy...not sure I'm making any sense here? Anyway...I love the composition and colors you chose Sandy. Sandy Sandy, hummingbirds and horses my two totems in life. So nice to have found you ...beautiful horse with you in your profile photo, I hope to find him as I stroll through your blog and learn more. Thanks for introducing yourself here, Willow. I look forward to getting to know you!